A sensational appetizer for two made for seafood lovers , our famous grilled or Fried Calamari, Shrimp, and Fish fillet, topped with onions and parsley. A real value dish of our finest seafood. SAVOIR THE BEST OF GREECE. One of our fabulous salads with the choice of a grilled fish fillet with Greek spices. Flounder, Basa or Grouper when available. Our recipe has been called the best ever! Avgolemono is made from chicken broth, rice, lemon, egg and chicken. Foamy, beaten eggs are combined with chicken broth to make this unique soup. This recipe has been called the great healing soup. A great compliment to any meal. This is a must try! FLOUNDER - is a lean, moist fish with a mild flavor, MEDIUM flakes and a firm texture. 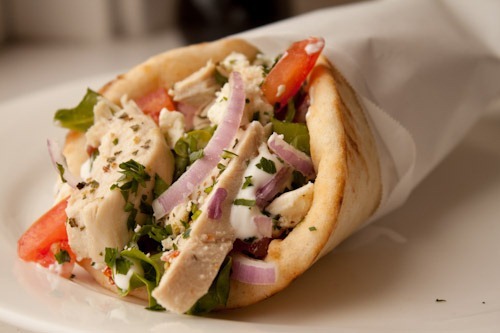 A filet of grilled or fried fish served in a warm pita with lettuce, tomato, onions, and tzatziki sauce.